Hotel Clementin, Prague discount hotels and accommodation. Situated in the centre of the beautiful Old Town Quarter, at the crossroads of ancient and modern Prague, the Hotel is an ideal starting point for discovering and enjoying the city. Everything is within easy walking distance: churches, palaces, restaurants, pubs, discos, shops, theaters, concerts, opera. 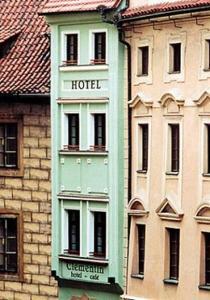 The Hotel Clementin, Pragues narrowest surviving building, is an integral part of the citys history. Built as a town - house around 1360, it retains many of its original gothic features as well as those of subsequent reconstruction: renaissance, baroque, and finally classicist. View photos, room descriptions and make online reservations at Hotel Clementin. Save on room prices at Hotel Clementin, Prague.